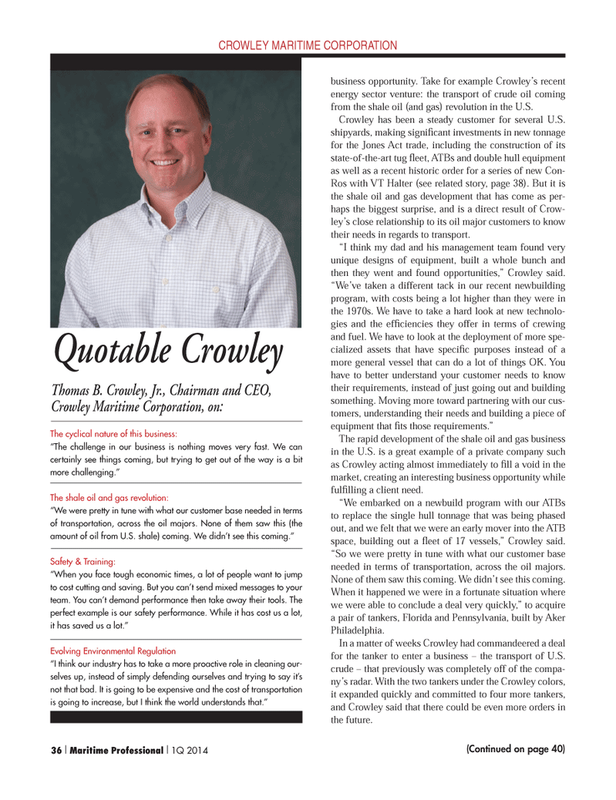 CROWLEY MARITIME CORPORATION business opportunity. Take for example Crowley’s recent energy sector venture: the transport of crude oil coming from the shale oil (and gas) revolution in the U.S. The rapid development of the shale oil and gas business in the U.S. is a great example of a private company such as Crowley acting almost immediately to fi ll a void in the market, creating an interesting business opportunity while fulfi lling a client need. “We embarked on a newbuild program with our ATBs to replace the single hull tonnage that was being phased out, and we felt that we were an early mover into the ATB space, building out a fl eet of 17 vessels,” Crowley said. “So we were pretty in tune with what our customer base needed in terms of transportation, across the oil majors. None of them saw this coming. We didn’t see this coming. In a matter of weeks Crowley had commandeered a deal for the tanker to enter a business – the transport of U.S. crude – that previously was completely off of the compa- ny’s radar. With the two tankers under the Crowley colors, it expanded quickly and committed to four more tankers, and Crowley said that there could be even more orders in the future.